I hate standing on the hard cold tile floor in the kitchen when I am cooking or cleaning up. My legs and feet start to hurt after-awhile. So I bought a cute little rug to go in front of the sink and dishwasher area, where I spend most of my time, to provide a little cushioning for my feet. Every time I go into the kitchen the rug is always a little askew. So I take my foot and straighten it out. That gets real old, real fast. When I had the chance to get a rug pad from Rug Pad USA I thought this could solve my problem. I have carpet in the rest of the house, so I thought how nice would it be to add some extra cushion, and stability to my area rug in the kitchen with a non-slip rug pad. Rug Pad USA also provide a rug pad designed to use over your carpet, so you can even add an area rug over your existing carpet if you choose. When you go on the Rug Pad USA site — rugpadusa.com they have it organized where it is so easy to find the exact rug pad you are looking for. You can shop by floor type, material type, and size. Click on the Rug Pad Buying Guide and it will explain to you exactly which pad will work best with your rug and floor. There are seven different rug pad types to choose from: Premium Lock, Super-Lock Natural, Econo-Lock Natural, Superior-Lock, Eco-Solid, Eco-Cushion and Eco-Fiber 100% felt. It was time to pick my rug pad out — I chose “Rug Pads for Stone/Tile” then that opened up a page with a small FAQ section at the top, to answer any questions I may have. Below that I chose what material I wanted my rug pad to be made of. Each type of pad is scored on a scale of 1-5 on three categories — cushion, durability and grip. I knew that I wanted a 5 in grip and definitely a 5 in cushion, so I looked for a pad that scored all 5’s. I chose the Premium Lock it was perfect for my kitchen floor with a 5 in all three categories. Now it is time to choose the size. I can choose the thickness, the shape, and the size I need. There is even the option to choose a custom cut size just for you, then just add it to your cart and check out, it was that easy, and my rug pad was on its way. 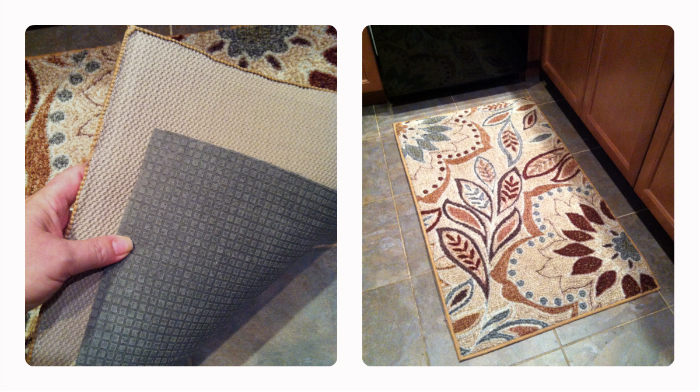 I love my Rug Pad USA pad, my area rug in the kitchen stays put and it has such a nice cushion under it. Now it is a pleasure to cook and stand on that hard floor. I am not tripping over my area rug anymore and it is not sliding all over the kitchen floor anymore and I am not constantly having to straighten it up every time I walk through the kitchen. The rug pad does NOT have that awful toxic chemical smell and is not damaging my floor at all. Since I am trying to go green as much as possible and get rid of harsh chemicals and toxins from my home, I was very pleased to find an eco-friendly company that makes such a quality product. *I was provided with a rug pad free of charge from Rug Pad USA in exchange for an honest review of their product on my blog.